...and I hope they will forgive me for it! I know that washing leather shoes using bubble bath gel goes against everything we ever learned, next to "don't dry your cat in the microwave" or "don't use the hair dryer in the bathtub", but it was a risk worth taking. You see, these aren't any ordinary shoes. They have graduated to favorite-shoe status in the category of ballerina flats for a while now and have suffered the consequences that go with the title: Battered and filthy, they would be either ruined by this ordeal and die a glorious bubblebath-smelling death OR they would be raised from the dead and grace me with their presence a few more months. Now that I think about it, I really should to do a post about getting too sentimentally attached to shoes that should have been thrown out long ago... Yes, there are more of that kind in my shoe-self. But I love the little bastards! What a nice colour! So... what happened exactly? Oh, nothing in particular. I returned home after a day of shopping and decided they were so filthy and disgusting I should either do something or throw them away. I couldn't do the later, so I decided to take a risk and give them a bath. And they survived it! i would so so scare to wash my shoes. How fun! I hope they forgive you. :) I like to use baking soda to make mine smell better. P.S. I did know Athens had a fashion week, but for some reason I thought it had already had it! Thank you for the site, I visited it but I was wondering if you could give me a little more information. Where exactly is it located? I don't think I'll be able to get in any tents, but it would be fun to hang around outside of it! Sooo, how'd the bath go? I'm interested in seeing if they survive. God knows I've got enough shoes that could use the same cleaning. i get totally sad when my shoes start to show (and sadly, smell) their wear. 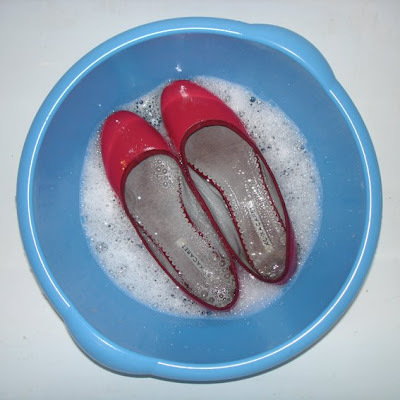 perfect flats aren't easy to come by - i hope your bath was a success! OMG. I hope it works out.